As with rock climbing, staying in balance while moving on snow is less tiring, more efficient, and safer than struggling to keep from falling only by clinging to something—in this case, the ice axe or the snow. 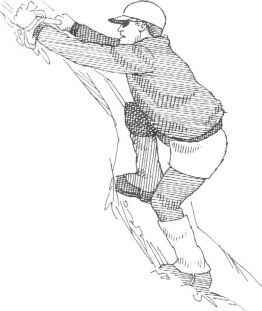 Snow climbers move from one balanced position to another, avoiding any prolonged stance in an unbalanced position. which is fully extended to make use of the skeleton and minimize muscular effort. In that position, let the trailing leg bear most of your weight. Always grip the ice axe with your uphill hand. The diagonal ascent is a two-step sequence: from a position of balance through an out-of-balance position and back to a position of balance (fig. 12-17). From the in-balance position, place the axe above and ahead into the snow. 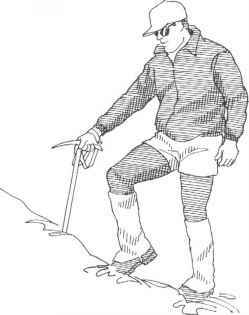 Move up two steps before repositioning the ice axe. The first step brings the outside (downhill) foot in front of the inside (uphill foot), putting the climber out of balance. The second step brings the inside foot up from behind and places it beyond the outside foot, putting the climber back in the balance position. Keep your weight over your feet and avoid leaning into the slope. If you're heading straight up the fall line instead of moving diagonally, there's no longer an uphill or downhill leg, or an uphill or downhill hand. So carry the axe in the hand that feels most comfortable and climb in a steady, controlled manner. 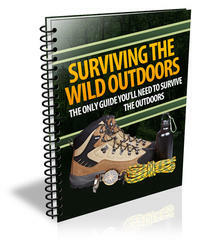 Regardless of the direction of travel, placing the axe firmly before each move will provide self-belay protection. Climbing a long featureless snow slope can give you the frustrating sensation that you're getting nowhere. Few landmarks help measure your progress, so distances are deceiving. Novice climbers try a dash-and-gasp pace in an attempt to rush the objective. But the only way to the top of the slope is to find a pace you can maintain, and then maintain it. The solution is the rest step, a technique that conserves energy as it moves you methodically forward. (The rest step is illustrated in Chapter 5.) Use the rest step whenever legs or lungs need a bit of recuperation between steps. At lower elevations it's usually the leg muscles that require a break. At higher elevations, the lungs need the pause. Here's a review of the rest step: the rest takes place after one foot is swung forward for the next step. Support all body weight on the rear leg while the unweighted forward leg muscles relax. During each mini-rest, the weighted rear leg must be kept straight and locked at the knee so that bone, not muscle, carries the load. The climbing pace is slow, because for every step there is a pause. Synchronize breathing with the sequence. At higher elevations you'll need to make a conscious effort to breath deeply and often. The technique of step-kicking is basic to snow climbing. It's a way to create a path of upward steps that provide the best possible footing with the least expenditure of energy. It is all that's needed for footing when the snow is yielding enough to permit security without the help of crampons or chopped steps. The most efficient kick to create snow steps is a swing of the leg that lets its own weight and momentum provide the needed impact, with little muscular effort. This works fine in soft snow. On harder snow, you'll end up putting in more effort, and the steps will usually be smaller and less secure. 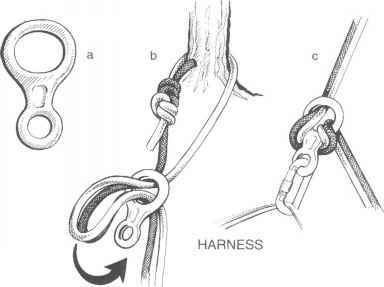 The definition of a secure step varies with the climber's skill and strength and with the effects of such factors as wind, altitude, and the weight of the pack. An average climber probably needs steps deep enough to take the ball of the foot when going straight up and at least half of the boot on a diagonal ascent. Steps that are kicked level or tilted slightly into the slope are more secure. The less space there is on a step, the more important it is that the step slope inward. When you're kicking steps, keep the other climbers in mind. They can follow up your staircase in good balance if your steps are spaced evenly and somewhat close together. Make allowance for climbers whose legs aren't as long as yours. Followers use the same leg swing as the leader, improving the steps as they climb. The follower must kick into the step, because simply walking onto the existing platform will not set the boot securely in position. In compact snow the kick should be somewhat low, the toe driving in and deepening the step. However, in very soft snow it is usually easier to bring the boot down from above, shearing off an edge of snow, which helps build a stronger step. A basic principle of snow travel is that parties move in single file when ascending. If you're in the lead, you will be doing by far the hardest work. You also have to think harder in order to avoid potential hazards to the group and to choose the best route. Take turns leading so that no climber is worked to exhaustion. You can either go directly up a snow slope or ascend it diagonally. If you're in a hurry, a direct ascent is usually the way to go. Speed is a primary consideration on a long snow climb, and a fast, direct ascent is the order of the day if you face bad weather, avalanche or rocklall danger, poor bivouac conditions, or a difficult descent. When time permits, most climbers prefer a diagonal ascent, switchbacking up moderately angled slopes. They reason that the lower angle of ascent requires less energy for each step while it ends up gaining the same elevation as the fewer— but steeper—steps of a direct ascent. The strength of this argument probably depends on snow conditions. In good step-kicking snow, the energy you save at each step on a diagonal ascent can be used to kick the additional steps required by that angle. But in marginal step-kicking conditions, many climbers figure that a diagonal route is more difficult because of the work of kicking edged, traversing steps in hard snow. In a straight shot up a snowfield, step-kicking is the basic technique for your feet. 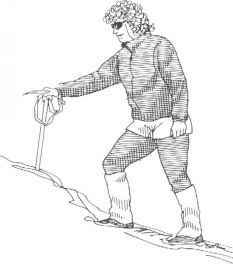 Ice-axe technique, however, will vary depending on snow conditions and steepness. Fig. 12-19. Direct ascent, ice axe in stake position secure with it. Setting the axe firmly before each move will provide a self-belay. 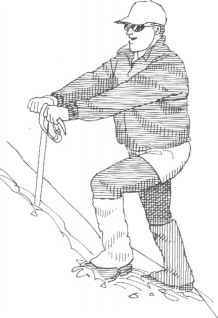 Stake position: At some point as the snow steepens, a climber may choose to switch to the two-handed stake position, a more secure stance often used for angles over 45 degrees (fig. 12-19). Before moving upward, plant the axe, with both hands, as far as it will go into the snow. Then continue to grasp it with both hands on the head, or with one hand on the head and one on the shaft. 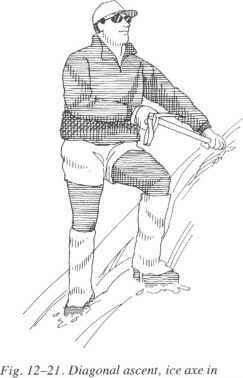 This position is particularly useful on steeper soft snow. On a diagonal route, remember to climb in balance as you kick steps up the slope. (Figure 12-17 shows the sequence of moves in a diagonal ascent.) For slopes angled less than about 40 or 45 degrees, the axe usually works fine in the cane position. 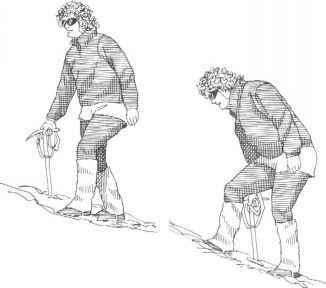 As the slope steepens, the cane position becomes awkward and it's time to switch to the cross-body position. hand grasping the head and the other holding the shaft, which is jabbed into the snow (fig. 12-21). The axe will cross diagonally in front of you. (Be sure the pick does not point toward your body.) Most of the weight placed on the axe should bear on the shaft, while the hand on the head merely stabilizes the axe. Move your feet upward in the same manner as with the cane position. Diagonal ascents often mean switchbacks, which mean changes in direction. There's a specific sequence of steps for a safe change in direction on a diagonal route, whether you have the axe in the cane position or the cross-body position (fig. 12-22). Start from a position of balance, the inside (uphill) foot in front of and above the outside (downhill) foot. Jab the axe shaft straight down into the snow at a spot as directly above your location as possible. Grasp the head of the axe with both hands as you move your outside foot forward, bringing you into the out-of-balance position. Continue holding onto the head with both hands as you move into a stance facing uphill, moving your inside foot toward the new direction of travel, and ending with splayed feet. Finally, a turn in the new direction of travel returns you to a position of balance, with the new uphill foot now in front and above. With the cane position, the new uphill hand now grasps the axe head. With the cross-body position, the hands holding the head and the shaft are now reversed. If splayed feet feel unstable as you change direction at a steep angle, kick the steps more directly into the slope. How to kick step in snow perpendicular?